On the surface, your traditional Thanksgiving spread looks like a nightmare for wine pairing. Turkey, that's a white food, and cranberry sauce is definitely red; green beans go with Sauvignon Blanc, but this is a casserole; and what the hell goes with mashed potatoes? In reality, Thanksgiving is a really forgiving meal in both substance and spirit. The experience of drinking wine is highly subjective — If you taste a wine when in a crappy mood, you are bound to be critical; taste that same wine along with good friends and an awesome dinner, and you might just find it great. At the Thanksgiving table, people want to enjoy themselves, so chill out! What critical thoughts people do have in their heads are going to be subconsciously suppressed, or redirected at Uncle Ted (can you believe he's drunk already?). Whatever misgivings are left will be quickly put to bed by tryptophan. Of course, you should still keep a few rules in mind. A simple tactic for Thanksgiving, or really any meal of numerous constituent parts, is to play towards the middle: keep the reds light and the whites big. Assuming you are not serving mutton or steak, your middle of the road wines are not likely to overpower any of the the dishes, but will certainly have the weight to hold their own. I am not the first to make this claim — far from it, in fact, so there are numerous "traditional" pairings for the classic turkey-centric American meal. Below are some of those classic pairings, and some good value examples for each. Though Pinot Gris/Grigio is most well known as the source of the typically banal Italian incarnation, in the Alsace region of eastern France, the grape takes on a very different character. Where the former is typically light and bland, Alsace Pinot Gris is quite full, almost oily, with exotic flavors of green apples, straw, and even acetone (trust me, this isn't always a bad thing). One of my favorite examples is the 2006 Mader Pinot Gris (about $18), which has a full body contrasted with an almost effervescent tingle, and finishes very dry. Riesling is one of those wines that has the unfortunate stigma of being considered "sweet." The inundation of the US market in the 70's with cheap German wines like Liebfraumilch and Zeller Schwartz Katz have left all Rieslings with a reputation for cloying sweetness and... not much else. In reality, Riesling is a highly versatile grape, which, depending on where and how it is grown, carries a range of sweetness from bone dry to liquid sugar. Most Rieslings from Alsace are quite dry, and bear a certain resemblance to Alsace Pinot Gris, though often with a floral component and some honey notes. Mader also makes a fine example of this wine, which has great melon fruit flavors and a long finish. If your taste does lend itself towards sweet wines, the right German Riesling would also work quite well. For most foods that aren't particularly spicy, you are not going to want to go too sweet — a good rule of thumb is to look for a wine with an alcohol content around 11 to 11.5%. The Weingut Johannishof Charta Rheingau Riesling 2006 (about $25) has been a favorite of mine for some time. This full wine has just a hint of sweetness, which accentuates a core of spice and mineral flavors, balanced out by just the right amount of acidity. Though rather uncommon in the US, Grenache is one of the most widely planted grapes in the world, and is the dominate varietal in several parts of France, Italy and Spain. Regardless of where it is grown, Grenache is typically light to medium bodied, high in alcohol, and full of red fruit and spice. Cotes du Rhone is Grenache's most well known appellation, where it is often blended with the fuller bodied Syrah. Higher end CDRs like Chateauneuf-du-Pape can get quite pricey, but some lesser known areas represent excellent values. This year, try the Domaine Catherine Le Goeuil Cuvee Lea Felsch Cairanne 2005 (about $18) — though the name is awkward, the wine is superbly smooth, with great raspberry and apple skin flavors and a long, long finish. For a different kind of Grenache, try the Argiolas Costera 2006 (about $17). Made in Sardinia from 100% Cannanou (a native type of Grenache), this wine has lots of strawberry fruit, along with a earthy element and lots of acidity — a great pick if you happen to be doing pasta next Thursday. Wherever they happen to be grown, the two native red grapes of Burgundy are as good as it gets when it comes to turkey. Pinot Noir, with its elegance, subtle aromatics, and lets face it, name recognition, is a great wine to pick when you are trying to impress. This year, one of my surprise favorites has been the Sebastiani Sonoma Coast Pinot Noir 2006 (about $16). This wine has a great profile of black cherry and pepper, and unlike a lot of Pinot Noirs from California, vibrant acidity and little oak influence. If a lush texture and fresh, jammy fruits are more your speed, try serving a Gamay. Most commonly associated with Beaujolais Nouveau (which hits the shelves today, fyi), Gamay is also the grape of the numerous cru Beaulolais, which run stylistically from bubblegum fruity to dark and brooding. The Louis Claude Desvignes Morgon Javernieres 2006 (about $26) is of the latter type; full textured, with dark purple fruit and granite flavors on a medium body with supple tannins. Though more often thought of as a stand alone celebration sipper, sparkling wine can actually make a fantastic match with shellfish, chocolate, and yes, turkey. Like still wine, sparklers have lots of taste improving acid and aromatic compounds, but bring along the added bonus of bubbles, further heighten flavor sensations on the palate. Though I love Champagne, I can hardly suggest that its price is justified — for a good value, one has to look abroad, which can often be a dicey proposition. Recently, I picked up a bottle of an Aussie sparkler called Taltarni Brut Tache for $20, and I was wowed. Made from the classic grapes of Champagne, this wine has a full mouth feel and notes of toast, peach and apple flavors, and a crisp, dry finish. The word "tache" refers to the slight pink tinge achieved by adding a tiny bit of red wine to each bottle. This festive wine is one of the best I have had under $40, and would be great before, during, or after the main event. Is there a more ubiquitous American dish than the hamburger? Pizza maybe, but it's debatable. Regardless, we love burgers. Whether it's just beef on bread or something more elaborate (foie gras burgers? ), the sandwich speaks to us. But we eat burgers all the time. So regardless of how good a burger may be, most end up forgotten. A blur of a meal enjoyed in the moment and forgotten soon after. Every now and then, though, a burger stands out. Something about it -- the beef, the bun, the toppings, the surroundings -- makes the ubiquitous unique. A couple years ago, I was stuck at a conference in Pittsburgh. Now I've attended a lot of conferences and one thing I learned early on was when things wrap up for the day, I should get as far away from the rest of the attendees as possible. The only thing worse than being at a conference you don't want to attend is to surround yourself with several thousand conference attendees who don't want to be there either. In short, we're a drag. After spending a few days trying out restaurants as far away from the convention center as possible, I broke down and slipped into a small restaurant across the street from the hall. It was the last day of the conference and all I wanted to do was eat, pack, sleep and leave. That's when I found the burger. The restaurant (who's name I can't remember or find) wasn't Asian, but the bar had Ninja Warrior on ESPN and a Samurai Burger on the menu. When it comes to burgers, the more bacon, cheese and mayo you can stick on it, the happier I am (Unless, of course, you have an avocado handy. A couple slices would be nice, thank you.) The Samurai Burger had none of it. Beef, bun, ginger mayo and seaweed salad, that's it. Nevertheless, I ordered it and loved it. The beef patty was well seasoned and the ginger mayonnaise was creamy with a terrific ginger bite. But what made the dish was the seaweed salad. It was crunchy, tart and a little salty. Absolutely perfect on top of the burger. I've had dozens and dozens of burgers since then, but only a few have stood out as much as that Samurai Burger. And while I don't know the name of the restaurant or remember what it put into the burger, I figured I'd take a crack at replicating dish. I figured that as long as I top the whole thing off with seaweed salad, I'd get pretty close. 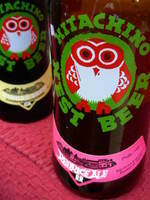 I paired the burger with a couple Hitachino Nest’s beers, the Red Rice Ale and the Real Ginger Brew. The Japanese red ale is slightly tart, crisp and slightly fruity. The ginger beer is a surprisingly refreshing reddish ale with a slight ginger finish. Both beers are far and away better than the clone-like Asahi, Kirin and Sapporo. Make everything about an hour before you're ready to grill. This will allow the flavors and ingredients to come together before you start cooking. For the ginger mayo, combine the mayonnaise, 2 tsp. of cracked black pepper, the green onion and one of the grated ginger roots (about 2 tbs.) in a bowl and mix. Cover and place in the refrigerator for at least an hour. To make the samurai burgers, combine the ground beef, remaining ginger root, soy sauce, sesame chili oil, sesame oil and remaining 2 tsp. of cracked black pepper in a bowl and mix thoroughly with your hands. Once the ingredients are combined, form four burgers. If you are planning to grill them immediately, do not refrigerate the burgers. Otherwise, cover the burgers with plastic wrap and stick them in the fridge. If you're using a gas grill, give the burgers at least 30 minutes out of the refrigerator before you get started. If you're using a charcoal grill, make sure you pull the burgers out of the fridge before you light the grill. When the grill is ready, place the burgers over the hottest part of the grill and cook for 4 minutes. 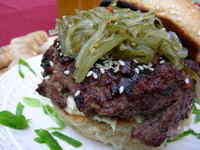 Flip the burgers, brush the hoisin sauce on and sprinkle the sesame seeds over top. Cook for another 3 minutes. Brush the sesame seed buns with canola oil. After 3 minutes, move the burgers to cooler spot on the grill. (If you like your burgers cooked to medium, leave them on for 5 minutes.) Place the sesame seed buns over the heat to toast for about a minute or so (watch them closely). Pull the burgers and the buns off the grill, slather the ginger mayo in the toasted bread and top the burger with the seaweed salad. As a proponent of eating local, seasonal food, I have become more active in researching various means of connecting with local farmers and vendors. One of the most direct routes to a local farm is a concept known as Community Supported Agriculture (CSA). CSAs are a partnership between the public and area farms that can take one of two forms: physical or monetary contributions. With a physical contribution, a member pledges to work a certain number of hours on the farm and receives a share of the harvest each week during the growing season. Usually the member picks up their share directly from the farm after they have worked their allotted hours. With a monetary contribution, an individual pays an agreed upon price, usually at the beginning of the growing season, and receives a share of the harvest weekly. The fee to join a CSA is used to cover the costs of farm production and can help smaller farms subsist throughout the growing season and beyond. Share sizes vary, but usually the produce from one week's share can feed an entire family. For those of us who are single or don't have children, some CSAs offer half shares that can feed one or two adults. Depending on the CSA, members either pick up their share from the farm or a centralized drop off location. Some CSAs even offer delivery direct to your home or office for a fee. There are benefits and risks to joining a CSA. The most obvious benefit is knowing how your food is being grown and who is growing it. For those who work the farm, the satisfaction of getting your hands dirty is a huge reward (not so much for this city girl, but apparently such satisfaction exists in others). Because you receive whatever is harvested for that week, you often discover new varieties of fruits and vegetables (adventurous cooking, anyone?). However, CSA members also bear the risks of a poor harvest or devastating natural phenomenon that can potentially ruin crops. Also, some people find not having control over what they receive in their share to be a negative. CSAs have grown in popularity over the last decade as more and more people take a stronger interest in knowing the source of their food. The concept behind CSAs can be traced back over forty years ago to Japan. Born out of concern for the increased use of pesticides in food production and the disappearance of small farms, the idea was first brought to the United States in the mid 80s. Originally thought of as a hippie ideal, CSAs are becoming more and more common in metropolitan areas and are spreading to smaller cities in the United States. There are several CSA options in the DC metro area that provide a wide range of fruits, vegetables, meats, dairy items and even flowers. Also, not all CSA farms use certified organic farming practices, often because of the costs associated with certifying a farm as organic. However, almost all CSA farms use little to no pesticides and have no qualms discussing their farming methods with interested individuals. Because of the differences in CSA methods and crop lists (what crops the farm grows and during what time of year they are available), some research should be done to find the one that suits you best. To shed some light on the variety of CSAs in the DC area, I've highlighted three with unique principles or approaches to the CSA concept. Clagett Farms operates a very popular CSA that serves the Washington, DC area and only requires a monetary contribution. The Clagett farm growing season runs from May to November and has two share pick up options: either at the farm in Upper Marlboro, Maryland or the parking lot of the First Baptist Church in Dupont Circle. To show their commitment to sharing their bounty with others, Clagett Farms also uses their farm to help those in need. According to the Clagett Farm site on localharvest.org, “We are committed stewards of our environment, ad distribute 40% of our produce to low-income individuals in D.C.” To learn more about the Clagett Farm CSA, including share pricing and how to join, contact Carrie Vaughn at 301-627-4662 or visit their site on LocalHarvest. Don't want to schlep out to a farm or designated drop off location to pick up your share? Karl's Farm may be the answer to your CSA prayers. For an additional fee on top of the CSA share cost, the Wiegand family will deliver your share to your home straight from their farm in Pisgah, Maryland. The delivery area, however, is limited to Bethesda, Chevy Chase, College Park, Silver Spring, Takoma Park or Washington, DC. Their growing season goes from May to December and they offer eggs as well as vegetables and herbs. Karl's Farm, like most all CSA's in the DC area, uses no pesticides in their farming methods and their eggs come from free range chickens. For more information on their CSA program, visit the Karl's Farm website. Last but not least is the Star Hollow Farm CSA, a uniquely year round CSA. This one is near to my heart because I have been a very happy member for almost a year. Star Hollow is a small farm located in Three Springs, Pennsylvania and is a Pennsylvania Certified Organic farm. Star Hollow has taken the CSA concept and made it much more user friendly for its members. Once you become a member, you pay $300, which is put in a bank account of sorts. From Wednesday at 7 am to Thursday at 7 am each week, members go to the Star Hollow Farm website and order either a small or large CSA box. Randy and Chris Treichler post an expected list of the contents for the small and large box on the storefront page so members can anticipate what they will receive on Saturday (pick up locations are in Adams Morgan, Tenleytown and McConnellsburg). If you don't like what's being offered in the CSA boxes, you can order from the online market, which includes a laundry list of vegetables, dairy products, fruits, mushrooms and eggs (even honey and preserves). The cost of your order is then deducted from the $300. Chris sends out a reminder when your account balance gets low. At any time you can cancel your membership, something not common to most CSAs. A more detailed description of the Star Hollow Farm CSA, as well as information on how to join, can be found at their website. CSAs are not for everyone and require a bit of a commitment (either monetarily or physically) up front. With the increased interest in CSAs has come an increased demand. Many CSAs now have waiting lists for people interested in joining and are bombarded when they open up their membership for the next growing season. To become a CSA member, it's important to research options in your area and contact the farm before their open enrollment period to express interest. However, from personal experience, I can tell you the rewards are delicious (nothing beats a fresh from the ground beet in my book). 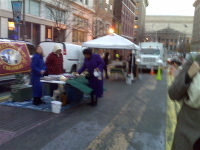 To find other CSAs in the DC area and beyond, visit localharvest.org, NewFarm's farm locator or the Eat Well Guide. One of the many benefits of living in the Washington, DC area is its proximity to many farming communities. Farms abound in Maryland, Virginia and Pennsylvania, giving the DC area an abundance of opportunities to shop for locally grown, largely organic, produce, meats and dairy products. Through farmers' markets, community supported agriculture (more about that concept later) and farm stands within driving distance of the District, it's easy to find healthy, quality food at a price that doesn't resemble our national debt. 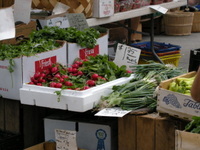 One such option is the local farmers' market and luckily, DC has many to choose from on almost any given day of the week. On Sunday, I decided to trek over to the Bloomingdale Farmers' Market, on R and 1st Street NW, conveniently located next to the Big Bear Café. Although a relatively new market, Bloomingdale has grown exponentially over the last year, bringing in new vendors to meet the demands of the growing neighborhood. Robin Shuster, the Bloomingdale Farmers Market manager, has been working hard to add a variety of sellers to the market and her efforts have been successful. The market now has sellers of all meats (beef, lamb, pork, veal and even goat), cheeses, vegetables, fruits and breads and pastries! 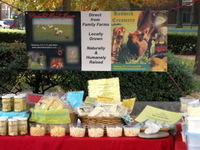 A new vendor to the Bloomingdale Farmers' Market is Keswick Creamery, a dairy farm located in Newburg, Pennsylvania that is committed to raising their cows in a humane and organic fashion. Their cheeses are made using the freshest of ingredients and the result is in the amazingly sharp flavors of their cheeses. Their cheeses include cheddars, fetas (including my favorite – their Italian herb feta), bleu cheeses and a pepper jack they lovingly call Dragon's Breath. In addition to their hard cheeses, Keswick sells yogurt, Quark (a German style cream cheese), whole milk ricotta and a soft cheese of fresh herbs called Bovre. 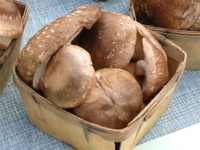 As I walked along the market, my eyes were immediately drawn to a lovely display of shiitake mushrooms. Dennis from Greenstone Fields Farm had a nice little haul of these earthy beauties, along with a big silver tub full of fresh rosemary. The rosemary was so fragrant, I could smell it the second I came to the stand. Dennis said the log grown shiitakes were probably the last for the season, so I grabbed a big container, along with a bunch of the rosemary. The mushrooms and rosemary would make great additions to an idea for a chuck roast that was forming in my head. And thanks to Robin's efforts, I could pick up said chuck roast right there at the market. Truck Patch Farms not only has a slew of vegetables (including brussel sprouts, a variety of greens, tomatoes, peppers and potatoes to name a few), they also sell beef. Huge chunks of beef might I add. The smallest roast I could find was over four pounds and FRESH! 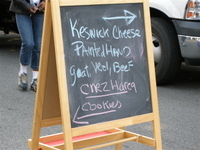 Truck Patch, like Keswick Creamery, treats their cows in a humane manner and provides a grass fed, natural diet for them. I added the roast to my lovely pile of purchases and then decided it was time for some breakfast. With that in mind, I headed to the lovely ode to carbs that is Panorama Artisanal Bakery. I will freely admit my almost slavish devotion to breads, pastries and pretty much anything made with flour. But the sight of the croissants, danishes and beautifully dark loaves of pumpernickel stopped me. Sadly, I only stopped because I couldn't decide what I wanted to devour first. 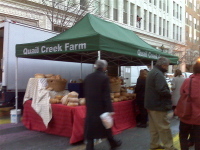 The variety of loaves and pastries that were available was impressive, especially for an outdoor market. Even better? Panorama had an assortment of sweet brioches…something I haven't seen in a bakery since my childhood in Germany. The cheese Danish I purchased was flaky without being delicate and had a subtly sweet filling. The perfect breakfast snack for such a lovely Fall day. The lovely roast was the center of my attention when I got it home. I've played around with variations of pot roast for years and find mushrooms, rosemary and wine to make a lovely sauce compliment to any beef. The recipe I devised was simple, allowing for the freshness of the ingredients to take center stage. 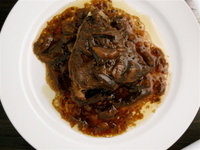 The result was a tender roast marinated in a rich, woodsy sauce. Heat the olive oil in a Dutch oven over medium heat. Pat the roast dry and sprinkle it liberally with salt and ground pepper. Place it in the Dutch oven and brown the roast on both sides for about three minutes each side. Remove the roast from the Dutch oven and allow it to rest on a plate. Add the garlic to the Dutch oven and sauté it for about two minutes before adding the onions. Sauté until browning and then toss in the mushrooms. Stir the mixture until the mushrooms have softened. Add the red wine and the beef stock and then place the roast back into the Dutch oven. Sprinkle in the rosemary and allow the broth to come to a boil. Once boiling, remove the Dutch oven from the stove and place it in the oven. Bake the roast for 2 ½ to 3 hours, depending on the level of doneness you desire. 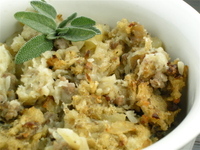 When the roast is cooked, remove it from the oven and take it out of the Dutch oven. Place the Dutch oven on the stove over medium high heat and add a tablespoon of cornstarch slowly into the broth. Stir consistently in order to reduce lumps. Allow the sauce to boil down to a thick gravy consistency. Serve the roast with the gravy, which should have lovely bits of mushrooms and onions, on top! Although the Bloomingdale Farmers Market is still relatively small (especially compared to Dupont Circle and Eastern Market's offerings), it is a welcome addition to the LeDroit Park/Bloomingdale/Shaw area of DC. 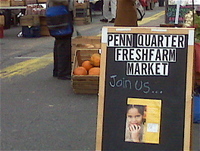 The market will remain open until the weekend on November 22, just in time for Thanksgiving. 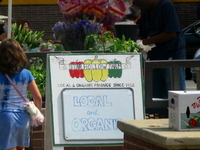 The market is open every Sunday, rain or shine from 10 am to 2 pm.